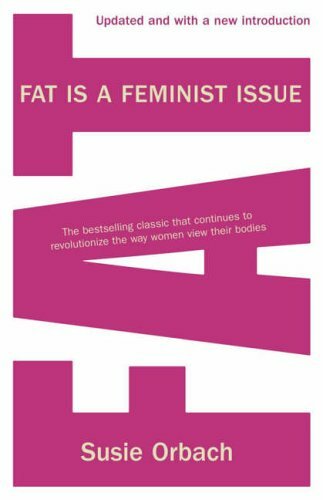 Fat is a Feminist Issue by Susie Orbach is one of those books I should have read a long time ago, but didn’t get around to. It’s an experience akin to reading The Lord of the Rings, in that I’ve read lots of things derived from it so it seems quite familiar. The central premise is that women’s relationship with their bodies is shaped by their experience of living in a male dominated society in which they are valued primarily for appearance. She is mainly talking about women living in rich, western countries, and acknowledges that she is not expressing a universal experience. Much of women’s energy centres around attempts to meet the beauty standard, which is currently to be very thin. This has a number of effects including that women have disordered eating patterns and perceptions of their bodies. In terms of eating, if you have spent your life eating according to a diet plan, then eating when you’re hungry is not something you may be used to. The book talks about the associations women have with being fat or thin and both states of being have positive and negative connotations. Much of this book is excellent. One thing that undermines the good stuff is that Orbach continually asserts that by learning to eat intuitively women will lose weight. This reinforces the message that losing weight is desirable rather than supporting the message that a healthy relationship with your body is more important than what it looks like. If you’re interested in body issues and eating disorders this is essential reading.